CARACAS, Sep 23 2018 (IPS) - The murder of journalists and changing forms of censorship show that freedom of expression and information are still under siege in Latin America, particularly in the countries with the greatest social upheaval and political polarisation. CPJ “is concerned about cases like the persecution of media and journalists in Guatemala and Nicaragua, the electoral polarisation in Brazil, the humanitarian crisis, repression and censorship in Venezuela, the deadly violence and impunity in Mexico, and the dangers for journalists in post-peace agreement Colombia,” Southwick told IPS from New York City. Mexico, which up to July was in the grip of an electoral campaign tainted by violence, has seen eight journalists killed so far in 2018 and 12 in 2017. The most recent victim was 28-year-old Javier Rodríguez Valladares, shot dead in the middle of the street in Cancún, in the southeast of the country, while he was interviewing with his camera a local craftsman, who was also murdered. Sandra Patargo, an activist with Mexico’s Red Rompe el Miedo (“break down the fear network”), reported that 146 attacks on journalists were documented during the electoral campaign. “On election day alone (Jul. 1) there were 32. And the rate of impunity for violence against journalists is 99 percent,” she said. The NVALabs network against violence records “a general increase in violence in Mexico, but in the case of women journalists this growth is alarming, at around 20 percent per year and it involves two-pronged violence: for being journalists and for being women,” said Luisa Pérez Ortiz, the founder of the organisation. There are journalists and media harassed or intimidated for covering the institutional crisis in Guatemala and the social crisis in Honduras, Lanza said, although the most serious case in Central America this year has been the hazardous coverage of the social rebellion in Nicaragua. On Apr. 21, as the wave of protests and repression that in five months has claimed hundreds of Nicaraguan lives broke out, journalist Miguel Ángel Gahona was shot in the head while filming a clash between demonstrators and police in the town of Bluefields, on the country’s Atlantic coast. A month earlier, on the border between Colombia and Ecuador, three members of a team of journalists from the Quito newspaper El Comercio were kidnapped and murdered by a dissident group of the Revolutionary Armed Forces of Colombia (FARC). Also this year, four radio journalists died at the hands of gunmen in different states of Brazil. One thing in common is that in their programmes they had aired cases of corruption involving politicians from their regions. "This reduction is not due to the global trend of changes in the newspaper industry, but to the monopoly of the government publishing complex for the import and allocation of newsprint," Carlos Correa, director of the organisation, told IPS. Correa argues that the death knoll for the print media is one of the three shortcomings of today's journalism that prevents coverage of what is happening in Venezuela today. Another is the attack, blockade and restrictions on digital media, "in an increasingly broad and sophisticated manner, ranging from the degradation of the quality of the Internet to direct state responsibility for the denial of service and lack of protection for names and domains on the web." But Southwick acknowledged that the murders of journalists have declined in countries that in previous years were more violent, such as Colombia, Honduras and Brazil. “However, the figures can be analysed further if we take into account that in some regions there is less violence against journalists because insecurity has reduced press coverage,” she reflected. The growth of digital tools “has been a great opportunity for journalists and media seeking to expand their ways of telling stories, but also for governments and other actors to try to limit, control and censor the press,” Southwick said. These controls from the political powers-that-be are carried out “through tactics such as account hacking, attacks against websites and, in cases such as Mexico, the monitoring of journalists with tools such as spyware,” she explained. These programmes collect information from a computer and transmit it to an outside entity without the knowledge or consent of the computer owner. “They also operate strategies to criminalise the use of social networks, such as the Anti-Hate Law in Venezuela or Anti-Terrorism Law in Nicaragua, used to monitor social networks and arrest people who send satirical or critical messages,” added Lanza from Washington, D.C., where the IACHR has its headquarters. An example of these actions is the case of El Pitazo, an on-line investigative news outlet in Venezuela, which has been a victim of “hacking” and denial of service attack (DoS) for more than a year, its director César Batiz told IPS. “And everything seems to indicate that these are people linked to the government with the complicity of the private sector Internet service provider,” he added. With the cyberattacks, El Pitazo has seen its daily users decrease, from 70,000 a year ago to 12,000 today. “The peak numbers of attacks were recorded in September 2017 and April 2018, when we published reports on the arrest in the United States, as front men for multimillion-dollar corruption, of relatives of high-ranking officials” in the power structure in Venezuela, Batiz said. 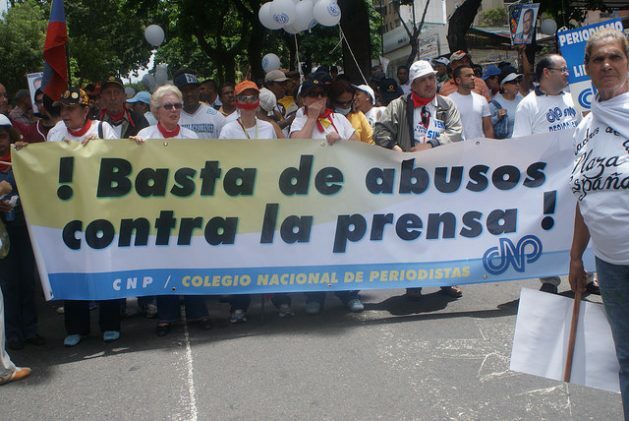 Southwick considered that “there are positive signs in the world of journalism rights in Latin America. Sentences and trials for the murder of journalists such as Jaime Garzón (1999) and Flor Alba Núñez (2015) in Colombia, and Pablo Medina (2014) in Paraguay…point against the cycle of impunity, although much remains to be done. “In Ecuador, under President Lenín Moreno, we have seen enormous changes in the relationship between the government and the media, and we expect changes in the Organic Law on Communication,” said the CPJ activist. In addition, “there has been good evolution in cases like Colombia, Costa Rica, Panama and Peru, and the changes made by Ecuador are very positive, since President Moreno has abandoned the organisation of the state apparatus to control information,” as happened with his predecessor, Rafael Correa (2007-2017). “When you look very closely, you find problems,” but “in general the region is inclined toward international standards of democracy with freedom of expression,” Lanza concluded.